I woke up early this morning, really wanting to do something special and yummy for my hubby to bring to his office as his breakfast. I have this urge in me that I must make something really tasty (yet simple! Haha) today, no matter what. This is so as to compensate for his lousy breakfast yesterday. Haha! Why is that so, you asked? 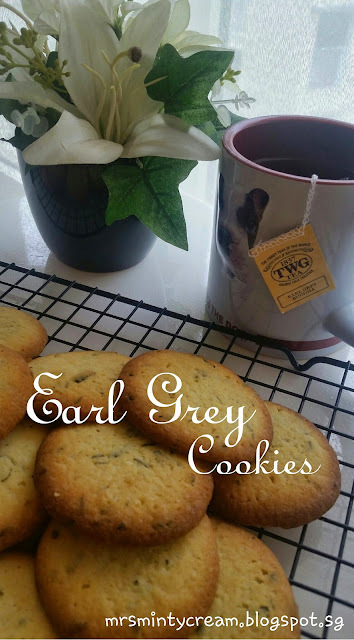 Alright, the background of the story is that yesterday, I happily packed some moon cakes and my Peanut Butter Cookies for my hubby as his breakfast, thinking that it was such a quick fix and I didn't even have to heat up anything. Great idea isn't it? Convenient and perfect for a lazy wife like me. Haha! But guess what? At the end of the day, I realised that Hubby only finished the Peanut Butter Cookies I made and left the moon cakes totally untouched! Tsk tsk tsk. That was the result I get of me being lazy in my breakfast preparation. After knowing this, I felt kind of guilty because I understand how important it is for him to have a hearty breakfast (with his usual morning coffee, of course) due to his heavy work nature. Oh gosh, how disappointed he must be when he saw those cold and hard moon cakes in his 'breakfast-box'. I'm sorry hubby. Redemption it shall be! 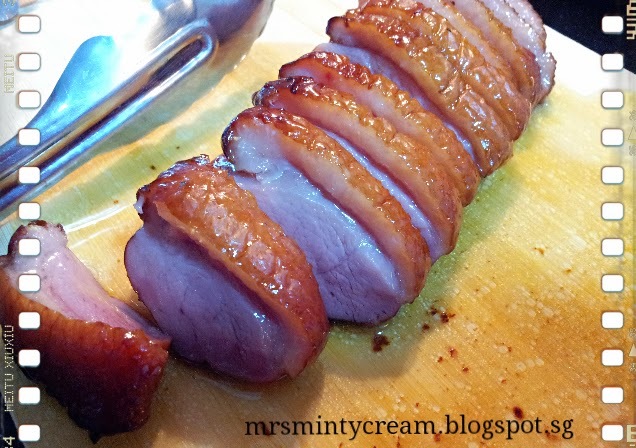 Just look at how inviting these thick pieces of smoked duck were. The slightly pink meat, the crispy skin, and yes, even the oil that is oozing out of the meat. Yummy! 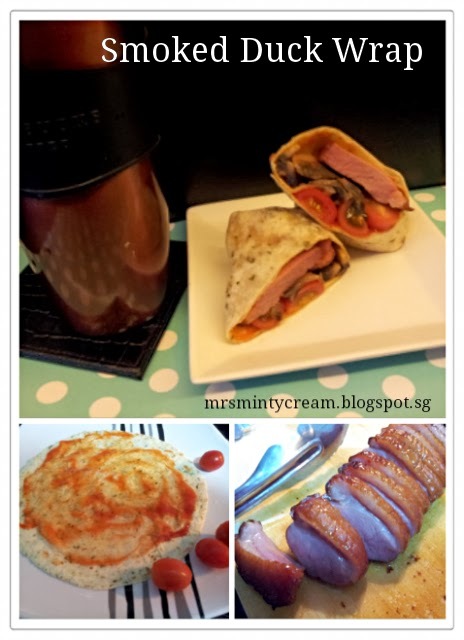 If you are a fan of savoury food (like me! ), then you will definitely love this! The duck was well-smoked and after some time in the oven, the duck skin was crispy yet flavourful at the same time! The only negative thing about this will probably be the fact that I did not cook the duck from the basic. Yes, it was from a box but what the hell? If anything from a box can be this delicious after just a couple of minutes in the oven, I am fine with that. Anyway, we are not having this sinful treat everyday so please spare me the health talk. Every now and then, we need something that is just heavenly tasty, don't we? This is how the completed Smoked Duck Wrap looks like. Yum! With some sautéed mushrooms and a couple of cherry tomatoes, it is completed! If you do not like mushrooms, a good alternative to that can be thin slices of cucumber or even some lettuce to give you the light and crunchy texture which I feel will go perfectly well with the saltiness of the meat. Since I run out of both cucumber and lettuce, I had to substitute them with cheery tomatoes and sautéed mushrooms. Did I mention that I am such a big fan for savoury dishes? Oh yah, I did! Haha. 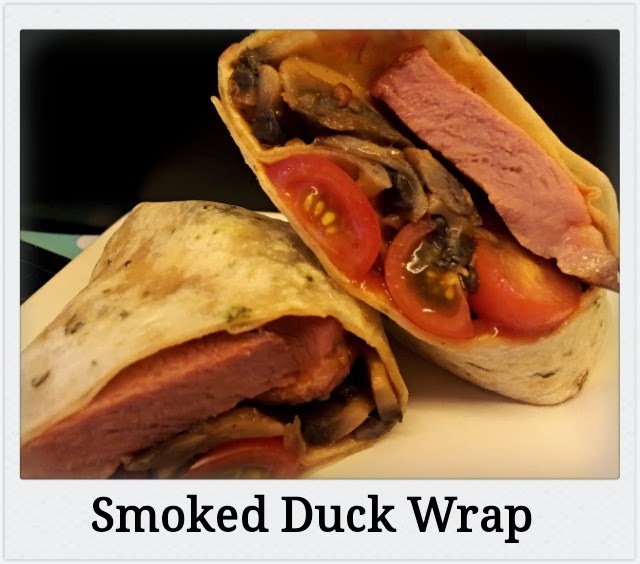 For someone like me, this Smoked Duck Wrap is like one of the best savoury breakfast dish I can wish for. My photos probably do not do justice to how good it looks in reality but I'm only using the camera from my Galaxy Note mobile phone, so I will just have to make do with it. But trust me, this wrap is really good! 1. Preheat oven at 200C and line a baking tray with aluminium foil. 2. Place defrosted duck on baking tray and cover with aluminium foil. Bake in the oven for 20 minutes. 3. Warm up the Onion & Chive Wrap using a saucepan over medium heat. Allow warming for 1 minute on each side of the wrap. Set aside for later use. 4. Wash and cut the cheery tomatoes into half. Set aside. 5. Wash and slice the white button mushrooms. Using a saucepan, add olive oil to the heated pan. Sautéed the mushroom and add in mixed herb and a pinch of salt for seasoning. 6. After 20 minutes of baking, check on the duck. The outer skin should starts to turn golden brown. Remove foil and bake for a further 20 minutes. 8. Spread the warm wrap with ketchup and chilli sauce evenly as the base over the entire wrap. Arrange the sautéed mushroom in the centre of the wrap. Place the sliced smoked duck (about 3-4 slices) over the mushrooms. Also add in the cherry tomatoes. 9. Roll up the wrap from the bottom and slice the wrap in half before serving it warm.